Comfort food doesn’t mean what it used to in 2017. With the vegan movement gaining traction in mainstream markets, sales of plant-based products have nearly tripled since 2016. This year, expect to see traditional favorites altered to meet dietary restrictions of vegans and those voluntarily tasting the revolution for themselves. Offering food reminiscent of home to elicit an emotional response in consumers has been a standard strategy for many eateries. Now, the ingredients will be a bit more unconventional. Incorporate your famous spreads with plant-based ingredients and options for everyone at the table. Consider preparing your home-style soups with chickpeas instead of chicken. Even veganize dessert with a cheesecake crafted from raw cashews and coconut milk. 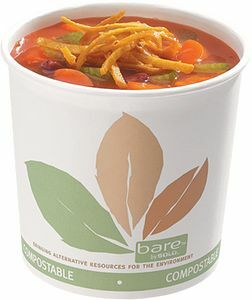 Appeal to the vegan market with environmentally friendly products like paper containers made with mostly plant-based renewable resources. Start with small alterations to the comforts your restaurant provides, and see a big impact on sales. I’ll see your fragrant flatbread and raise you a saucy mouthfeel. Topping the charts in 2018 is beyond what we can taste. Consumers want all their senses enhanced when enjoying a quality meal. Of the five senses, texture is what consumers are grabbing onto. By now different aromas have been experimented and enjoyed, but what about the how the food makes your mouth feel? Create an interactive mealtime to engage your customers. Taste buds will come alive by adding chopped nuts to the breading of fish or crunchy salad garnishes. Adding pesto to sandwiches instead of dressing will treat your consumer to a tasty surprise. Soft tofu can add a distinctive texture to stews or frittatas. Serve textured entrees on laminated foam plates for a durable option to a complex meal. The laminated foam creates a strong cutting surface and helps support heavier foods like fish. The texture of an entrée will keep loyal customers on the edge of their seat and bring new customer’s back for more. Try it with Conex® Galaxy® Translucent Cups! It’s inevitable, what you eat is what you post. The third trend of 2018 comes to us purely for the aesthetics. The edible flower is the trendiest garnish you can incorporate into a dish. According to a study by WGSN there have been over 186,000 Instagram posts about edible flowers in just the past few years, and that number is growing. A picture says a thousand words, and that picture has about a thousand followers who could be eating at your restaurant. Top a bisque with hollyhock to add flair to an otherwise visually dull dish. Enrich a signature dessert with dried petals to exude a more sophisticated look. For a stress-free menu addition, freeze edible flowers into ice cubes or top pink lemonade with fragrant lavender. Roses, marigolds, and lavender are not only edible, but make a bold, colorful statement to the customer. Use flowers that match your restaurant’s branding for a cohesive dining experience. Use translucent cups to easily display your photogenic beverages. Move over muffins, 2018 is looking for savory and flavorful on the morning menu. This trend originates from popular Chinese street foods gaining fame in New York’s restaurant scene. Requesting peking duck or kimchi before the morning commute is not unheard of anymore. Update your breakfast options with umami-rich entrées to add zing to the morning muddle. Give your customers exceptional flavors in the a.m. like barbeque and srriracha. Most importantly, make these savory breakfasts easily portable because breakfast can’t always turn into brunch. Pack to-go orders full of extra portion containers of sauces and toppings so customers can customize the level of flavor. Looks like 2018 isn’t as sweet as you thought. Spice it up and your patrons will be pleasantly surprised. Try it with Fusion Steele® Stock Printed Insulated Cups! The super food of the new year is a green, lean, nutrient-rich machine. Morninga doesn’t have an overpowering flavor or big color profile, making it more versatile than supplements like turmeric and matcha. This ingredient has a subtle, dried spinach taste and is rich in protein, fiber, potassium, calcium, and vitamin A. Adding moringa to lattes, smoothies, and tea will provide a health alternative that all consumers can appreciate. Moringa can even boost your guacamole, chicken soup, or pumpkin seed cupcakes. Simply add moringa to a few items on the menu or advertise as an optional supplement, and serve it in a product design they will remember that keeps the beverage at serving temperature until the last drop. Serving lattes in graphically enhanced cups with an insulated core will show the customer, you considered the whole package. Consumers will be impressed with the trendy update and curious to opt into a feel-good healthy snack. Try it with PresentaBowls Pro® Square Bowls! Tacos are not going anywhere in 2018. The new year is bringing some funky, semi-questionable entrées with it, but our beloved tacos are here to stay. These tortilla-hugged bundles of joy are getting a makeover for the better. The taco transformation includes inventive ingredients like seaweed, Nutella, or beets. Unorthodox taco mealtimes like breakfast and desserts are gaining popularity, and Tuesdays won’t be the only day this menu item is ordered. Customer’s want tacos all day, everyday. Take advantage of consumer’s desire for this timeless dish by putting a put a twist on a classic with your restaurant’s signature tastes. Your original style will have customer’s hungry for more. A study by Technomic reported that fish is the fastest-growing taco protein, up 61.5% over the last year alone. Switching up the protein may prove profitable, especially if you display your new menu items in clear packaging to catch the customer’s eye. Your predictable options should be unpredictable this year; keep the taco train rolling all the way into twenty-nineteen. Try it with Insulated Foam Bowls! Last and debatably the most interesting trend of 2018 is “goth” food. Experiencing a year full of unicorn Frappuccino’s and glitter frosting was exhausting, but black is back and bigger than ever. Activated charcoal is claimed to detox the body, giving it a superfood ranking competing with our fifth trend, moringa. Jump on this dark craze and reap the benefits. Serve charcoal ice cream in insulated foam bowls to create a conversation starter and a retweet-worthy photo. If you’re feeling inspired by this trend, attempt whipping up a batch of charcoal waffles and top them with maple bacon, roasted balsamic tomatoes, and Portobello mushrooms. Now that’s a dish to remember. Contact sales@dart.biz for purchasing information!